Detailed guides teaching you how to use Galaxy Note 5, how to customize Galaxy Note 5, how to use S Pen and S Note on Galaxy Note 5, and how to use Galaxy Note 5 camera. Galaxy Note 5 camera guide. Actually it is almost impossible for any users to use all Galaxy Note 5 features. But when you want to do something that you don’t know how to do, Galaxy Note 5 how-to guide will be your life-saver. This is a live page. New Galaxy Note 5 how-to guides will be released regularly after we finish the test. So, bookmark this page if you are a owner of Galaxy Note 5. We test each of the Galaxy Note 5 how-to guide before releasing it here. This is to ensure all these how-to guides are clearly and precisely presented. We try our best to make the Galaxy Note 5 how-to guide easy to follow with detailed and clear instructions. If you want to download or read the official Galaxy Note 5 User Manual (in PDF format) in your own language, please check this page. Please note, Galaxy Note 5 how-to guide is specially prepared for Galaxy Note 5. The guides may not work on other Galaxy Note devices. If you are using Galaxy Note 4, please check this Galaxy Note 4 how-to guide page. If you cannot find the Galaxy Note 5 guides you are looking for, please feel free to leave you questions or problems in the comment box below. We will try to find a solution or an answer for you. We may also release a detailed how-to guide for it. This part of Galaxy Note 5 how-to guide covers most commonly used features and operations when you get your Galaxy Note 5. How to use Galaxy Note 5 home screen? How to create app folders in Galaxy Note 5 home screen? How to use Galaxy Note 5 multi-window? How to add apps to Galaxy Note 5 home screen? How to use widgets on Galaxy Note 5? How to transfer data from your old device to Galaxy Note 5 with Samsung Smart Switch? How to take screenshot on Samsung Galaxy Note 5 without using any apps? How to access and use Galaxy Note 5 notification panel? Download the official Samsung Galaxy Note 5 user manuals with Android Nougat update in your own languages! Read on…. How to use Galaxy Note 5 fingerprint scanner? How to backup Galaxy Note 5? How to use Galaxy Note 5 notification reminder? How to uninstall apps or disable apps on Galaxy Note 5? Android is fully customizable. You can customize Galaxy Note 5 as you want in many aspects. This part of Galaxy Note 5 how-to guide shows you how to customize Galaxy Note 5 to meet your needs. How to access Galaxy Note 5 developer options?And how to hide Galaxy Note 5 developer options? How to disable Flipboard Briefing on Galaxy Note 5 home screen? How to silence Galaxy Note 5? How to customize Galaxy Note 5 ringtone? How to customize Galaxy Note 5 notification tone? How to use change app icon size with Galaxy Note 5 screen grid? How to disable S Finder and Quick connect in notification panel? How to make emergency calls on Galaxy Note 5 when screen is locked? How to boot into Galaxy Note safe mode? 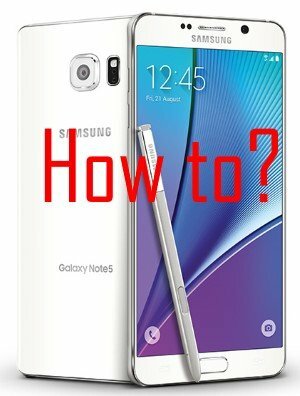 How to boot into Galaxy Note recovery mode? How to reset Samsung Galaxy Note 5? How to use use USB OTG to expand storage for Galaxy Note 5? How to connect Galaxy Note 5 with PC? How to block some contacts? S Pen and S Note are the signature features in Galaxy Note devices. Galaxy Note 5 introduced some new and improved features for S Pen and S Note. This part of Galaxy Note 5 how-to guide shows you how to use S Pen and S Note on Galaxy Note 5. You may also check our S Note guide for a few additional tips and tricks on using S Note. How to use Samsung Galaxy Note 5 screen off memo? How to use scroll capture on Samsung Galaxy Note 5? How to use air command in Galaxy Note 5? How to add your favorite apps to Galaxy Note 5 air command? How to use action memo in Samsung Galaxy Note 5? How to use smart select on Galaxy Note 5? How to use screen write on Galaxy Note 5? How to use Galaxy Note 5 air view? How to use pen select on Galaxy Note 5? How to use direct pen input on Samsung Galaxy Note 5? Galaxy Note 5 has one of the best 2015 smartphone cameras you can find. There are also some new features that even seasoned Galaxy Note users may not know. Galaxy Note 5 camera guide will show you step-by-step how to use these new features and some other useful camera features. How to use Galaxy Note 5 live broadcast? How to use Galaxy Note 5 video collage? How to use Galaxy Note 5 camera quick launch? How to use Galaxy Note 5 camera tracking AF? How to use voice commands to control Galaxy Note 5 camera? How to save photos in RAW format in Galaxy Note 5? How to use Galaxy Note camera burst mode? How to talk wide selfie with Galaxy Note 5 front camera? How to use gesture control for Galaxy Note 5 front camera? How to assign volume keys with different function in Galaxy Note 5 camera app? How to use Galaxy Note 5 camera app interface? How to use Galaxy Note 5 camera HDR? How to use Galaxy Note 5 camera selective focus? How to use timer in Galaxy Note 5 camera? Have any questions on using Samsung Galaxy Note 5? or do you want to read other Galaxy Note 5 how-to guides? Please let us know you question or request in the comment box. Do you mean the mobile data button? In most regions, the button is included in the quick settings (swipe down twice from the top of the screen, or swipe down with two fingers). Did you check it there? Right from the top always shown headphone display on the status bar .how should i disable. What do you mean auto redial? In call history, you can redial the number by pressing the phone icon. How to decrease touch sensitivity in note 5 ? Samsung removed the option for users to adjust touch sensitivity. You have too visit local Samsung service center and ask them to do it for you. Where are the details on the camera ie Part IV of your writeup? I am specifically looking for the timer icon – I don’t see it in my camera screen. Neither volume key is doing anything. All other keys are functioning normally, though there seems to a delay in typing, i e the phone seems to be running slow. I turned it off all night and fully charged it. No physical damage, less than a year old. If volume key is not working, you have to visit local Samsung service center to check the hardware. For the slowness, it’s not necessarily to turn off the phone every night. You can try to clear cache partition to see whethet it helps. Why portrait/landscape view suddenly quit working. My quick connect is set to Auto Rotate..
Email, videos, books, etc. Will not rotate to landscape. Makes watching videos and reading some emails difficult. Did I turn something off, or last update do something? if the settings is correct, you can try to reboot the phone to see whether it helps. Ok so I can’t find the answer anywhere. I downloaded notification tones programmed them to my contacts for my SMS notifications and it still plays as a default tone when I am alerted to having a text message. Is there anyway to fix this? Did you check the notification tone in the messaging app? I recently got a note 5, and I noticed that in the camera, I can’t disable the burst mode. when I try to press and hold the middle button to focus and take the shot, it starts taking pictures non stop. I can’t find any thing that helps in disabling this feature. You cannot disable burst mode in Galaxy Note 5. Samsung removed the option to enable/disable the burst mode. How do I change the way my PDF files open so that they open in a Browser instead of with “Write on PDF?” Firefox is my default browser. Until a few days ago the PDF files would download and show up in my notifications area. A few days ago foe some reason I was given an option of which to use to open the PDF, Firefox or Write On. I guess I picked the wrong one. Now when I click a link to a PDF file, instead of downloading and giving me a notification like before, it opens in Write On PDF. And when I flip through the pages I end up scribbling all over it. I’ve gone into settings and applications, and looked an S Pen & S Drive to clear defaults, but that button is greyed out and there are no default sets. So I’m really stumped. I’m hoping someone can tell me how to put it back the way it was. Did you change any accessibility settings? You may try to reboot the phone to see whether it is caused by some apps. Your digitizer might be damaged. Note 5 screen is so delicate that slightly more pressure will damage it. Unfortunately Samsung does not cover it under warranty. In my Note 5, I have new problem. recently my whatsapp call get disconnected after 2minuts ( 2 minuts is my screen time out). and if touch on screen call will be reconnected. Looks like phone is also sleeping with screen. can i do any thing to keep the call active till i disconnect. Another thing i noticed is whatsapp messages are not reaching my phone while sleeping. once open the screen all will be downloaded. Did you install any battery saving or task manager apps? Also did you turn on power saving mode? For WhatsApp messages, it seems you turned off syncing. You can turn it on with quick setting buttons. When I am looking at my lock screen it says content hidden for the voicemail? How do I fix this? Settings– Lock screen and security –Notifications on lock screen. No, the default messaging app in Galaxy Note 5 doesn’t have this feature. You may check whether there are any third-party apps for this. Hi My SAMSUNG Galaxy Note 5 Back button, Quick Launch Camera (Double Clicking Home Button) stop working. How do you decrease the screens sensitivity on the Note 5? Samsung removed the touch screen sensitivity settings for long time. If you need adjust it, you can visit local Samsung service center. They can adjust it there. Hi Simon. How can I undo “block” command of multiple download? Thank you. When I try to post a picture on Twitter or fb or Instagram I get a message to turn off screen overlay. Confused!!! Not sure about the error. You can try to check Settings– Applications –Application manager, tap MORE button (top right), tap Apps that can appear on top. Nobody can help if you forget the password. There is no way to bypass the encryption. You probably have to reset the phone and lose all data. There are many photo editor apps that allow you to create a collage. There are also a many collage apps. If you want to use both front camera and rear camera, you can download dual camera mode. Then you can compose the photo with both front and rear cameras. Yes, the Samsung photo editor (accessed from gallery app) have the feature to create a collage. But in some regions, it’s not pre-installed. It may direct you to galaxy apps to download and install. You have made this wayyyyyy too complicated, not sure if this is your intent. For those who would like to make a collage tap on the picture to make the picture full screen, hit edit and choose collage! How do I create a signature in my text messages for Note 5? No, you cannot create a signature for messages on Note 5? Why do you need a signature on a 140-character message? You can use a signature for emails. You can put signature in email. Inside email app, for each account, you can set a signature. For SMS, no, you cannot set a signature by default. You may try to use other messaging apps which may allow you to set up a signature. The default Samsung messaging so doesn’t have this feature. Are you sure you need a signature for a SMS? Swiftkey has a clipboard where you can save your signature and other items you might use a lot. When you want to insert your signature, touch the hamburger icon on the top left of the keyboard, select your clip, an it’s inserted. When i select “add ringtone”, it will lead me to One Drive screen where the only option given to me is to sign in to One Drive or One Drive for Business by keying in my email address.. Why is this happening? All I want is just to add ringtone from my play music file..
Because you set one drive as the default app for that action. You can clear it in settings – Applications – default applications. In Note 5, the default app will be set based on the app you used when you are prompted for selection the app first time. Thank you so much..Problem resolved.. I still don’t understand where the ringtones are. I went to settings and it says click on ringtones to listen to them. There is nothing there to listen too!!!! I just got this note 5 this afternoon. take a screenshot and share it in our facebook page so that others can see what you get. You can visit local Samsung service center and they can adjust the touch sensitivity for Note 5. Don’t try it yourself. I leave my note 5 charge for overnight… is this will effect my battery or my phone?? Unlikely it will affect battery. But it will not do good either. Also, in some regions, the voltage in night may be not stable, it may affect the charger… But anyway, it is not necessary to get up at 1am to disconnect the charger. How I need help every time I take a selfie it flipes the picture And I’m tired of it, is there any way I can undo this? Of course, you can change it. Start Camera app, switch to front camera, tap settings icon (gear icon). Turn on/off save as previewed to see the difference. My touch screen is broken. How can I retrieve my data from the phone? When it’s connected to a computer it shows nothing? If the screen is locked, you cannot access the files on the phone. This is exactly the purpose of the screen lock. If the phone is connected to internet, you can use Samsung’s find my mobile to unlock it when it’s connected the PC. You may visit local Samsung service center to see whether they can help you backup the data. That’s the thing, no, I don’t BUT the bt signal is very weak with my other bt devices. I have a bt tower speaker that’s always cutting out when I use the phone pair only a couple feet away. When Marshmallow comes out, will it have any fix for bt strength? And will it mess my note 5 up like lollipop did to my G3? For Bluetooth signal strength, you can ask the service centre to do a test for your device. I don’t think it’s a known problem. The Marshmallow update probably will not change much about Bluetooth. If you are not sure about the update, you can wait a few days or weeks to see whether there are any serious problems with the update. Normally, Samsung will withdraw the update of serious problems are found in the update. Very often update problem is region-specific. Hey Simon, I got one for you…I have a note 5 and it’s GOT to have the weakest blue tooth strength I’ve seen, and ALL Samsung galaxy phones I’ve had are WEAK in blue tooth. It keeps disconnecting from my High end Alpine car stereo system when it’s 1 foot away from the head unit. THEN, once it disconnects, I have to completely re establish the bt connection ‘from the phone’ in order for the functions on the stereo to work, like skip song etc. I’ve thoroughly determined it’s the phone, not the stereo. My girlfriend’s Droid NEVER disconnects. What’s a fix or will there be one for this crappy BT signal? Not sure about the issue or a fix. I guess it depends on the pairing (software stack) as well. Do you have same problem with other Bluetooth devices? How can I add S Translator to the context menu in Note 5? What context menu? It should depend on individual apps. I don’t think you can modify app behavior. In Marshmallow update, you can use Now on tap. It’s probably something similar. to what you want. But it’s not for S translator. I just upgraded to the note 5 after previously owning the note 4. Is there anyway to change my bookmarks to look how they looked on my note 4? In my Samsung bookmarks on my Note 4 they were in a tile format that showed a small picture of the actual website. On my note 5 it’s just a standard bookmark with just text, very much like an old Windows XP bookmark. Any help would be much appreciated. Thanks! I don’t think you can change it. I cannot write on my pdfs keeps stating they are read only? How do i over come this? You need Choose “Write on PDF” when opening PDF files. Did you try different PDF files? Oh, and one other question – do you know of any way to customize the stock keyboard? I hate the voice recorder button and would love to remove it. I never use that feature and hit it on accident almost every time I try to hit the Space bar. And if that’s not possible, any suggestions for a 3rd party keyboard that is reliable and doesn’t cause many issues/interferences with phone function? Thanks! You should try Google keyboard. It is far better. Voice button is for Google voice typing. You can disable it if you don’t use it. Go to Settings– language and input –default keyboard –Set up input methods –un-check Google voice typing. Hi there, is there any way to resize a photo without cropping? My S5 had this functionality under its Edit mode for the photo, but I can’t figure out a way on the Note 5. I’m specifically looking for this to use when texting a photo (I like to take the photo with full resolution, but that leads to texting 5MB pics most of the time and they often have trouble let sending that large). The Gallery app and built-in Samsung photo editor does not offer re-sizing. There are a few apps that can resize the photos. You may try Photo Editor. Actually, it is NOT to re-size photos for SMS. The SMS app will automatically resize photos before sending. I like to edit the names of the Web pages I add in my quick access, however on my note 5 I can’t seem to find how I can edit the name of the pages added to quick access. Also can’t delete the default bookmarks saved in the Internet browser. Is it possible to do so or am I stuck with the preloaded bookmarks and titles of quick access pages? I don’t think you can rename the quick access part. For bookmarks, you can tap and hold, then you can find the delete button near the top. anyway, why don’t use Chrome? “More” button? You can take a screenshot and share it in our facebook page. Open Internet, tap Bookmarks at the bottom, select bookmarks -my device. Tap and hold a bookmark, in the top right, you should have Delete and More buttons. Anyway, your phone may have different firmware. I would like to add some pictures to your defaulted categories but can’t figure how to do it. . I can remove them easily. Also can I make my own categories? On the Note 4 i was able to rearrange the order of action memos. I don’t seem to be able to do that on the Note 5. Is that correct? Action memos are arranged by time created. I don’t think Note 5 allows you to customize the order. If you have many action memos or S sotes, you can use folders to manage them. Don’t get rid of anything. Covers don’t cover up the fingerprint reader. Clean your hands first, then when re programming your print, place your finger on the reader a little on each side of the finger and centered. This allows the reader to see the whole print. Mine works flawlessly unless my finger is wet, very dirty or just on the sensor wrong. I had the same problem but after realizing my fingers were dirty when programming, I cleaned them and re registered my thumb and index fingers on each hand and it works flawlessly. Make sure as your programming it, you put your fingers a little sideways each time too. That helps the phone recognize the fingers without perfect, straight placement. I promise this wil work. In Note 5, you just put your finger on the home button. It is not necessary to swipe as in Note 4. Also, fingerprint sensor in Note 5 is far more accurate and responsive than that in Note 4. The case should not be an issue as long as you can put your finger on home button naturally. As pointed by Bird, you should spend some time in registering your fingerprints. For dominant finger, you can register it more than once so that it can be easily recognized. In settings – lock screen and security – screen lock type, change it to something else. You can remove all fingerprints in settings – lock screen and security – fingerprints. Actually Note 5’s fingerprint sensor works very well. You should follow the on-screen instructions and try to register again. You can register frequently used finger twice. You can set lock screen security to anything else. You can also deregister the fingerprint in fingerprint manager on Note 5. What specific problems did you get? I just learned that there is no setting for touch screen sensitivity in Note 5. I just upgraded from the Note 3 and was convinced to buy a protective glass for my screen at the store, which I think has compromised the sensitivity. At times I swipe or hit a key and nothing happens. It happens a few times a day and is very annoying. Is there any alternative to help this or do I have to return the glass protection and hope that solves it? What glass protection? Most tempered glass screen protectors do not have any issues with touch sensitivity. If you need adjust touch sensitivity, technicians in the service center may help you to adjust. I want to transfer 2 videos from my Note 5 to my Chromebook. The videos is too large for email. And whenever I try to share it on google drive, the files won’t transfer. I’ve tried to transfer the videos to a PC by plugging the phone into the PC, but the videos don’t appear on the PC even though they are on my phone. What do I do? When you share the video to Google drive, you need open Google drive and update. Also, by default, upload starts only when you are connected to WiFi. And it’s done on background. Actually, you can automatically back up all photos and videos to your Google drive through Google Photos. For connecting Galaxy Note 5 with the PC, photos or videos will not show automatically. Your Note 5 is connected as USB storage. You can user windows explorer took find the phone and go to DCIM folder to copy the files. If your Note 5 is listed, but nothing under it in Windows explorer, you may need unlock the lock screen once. I am a havy user of the S Note app. Since Note 2 I was crazy about all the cool features that helped me be more productive. Buy now, on my new Note5, I can’t find some settings: I am not able to set a default first page background on a note and than to have anouther background on the rest of the pages. This was very helpful on meeting notes. And I cannot find how to fix the resizing rate on inserted pictures. I I whant to resize a picture, it will let me resize it freely. I don’t whant that. I whant to be a fix rate resizing. Is there any setting about this? Thanks. Unfortunately, many good (and bad) features in S Note were gone during “updates”. It seems S Note developers do not know what they are doing. They are not connected to users. When I’am playing video in my note 5, it just showing black background with a pc logo and arrow in the middle of it. The video format (codec) is probably not supported. You may try VLC for Android to see whether it can play that video. I’ve try VLC, when playing video it show black background with orange cone logo in the middle. I’ve figured that the pc logo with arrow is the logo of screen mirroring, but I didn’t turn screen mirroring on. Is there any solution for my problem ? You can take a screenshot and share it on our Facebook page so that other members can see it. How to delete videos to on the note 5…I know that in order to delete the photos you have to go to the Google’s photos but it not working for the videos. You can manage all images and videos in Gallery app. You can also use My Files app to manage (including delete) all files (including videos) on the phone. Not sure what exactly you are referring to. But the ink color of the S Pen in S Note is always the latest color you used. If you like black, you can set ink color to black in a s note. How do you set up a signature for email? Is there a way to set the local area code on the note 5? My S4 was easy to set, but I can’t find the feature on this phone. Many of my contacts were transferred from the S4 with no area code and now I have to manually redial most of my friends phone numbers, or go back in and add the area code to all the contacts. Did you try to sync the contacts through your Google account? The area code should be synced if you sync them through Google account. i recently bought my Note 5. However, it seems like the battery is having a problem. I charged my phone one morning and was 100% charged at 10am. I checked my facebook and whatsapp, the rest of the time was left idle. I turned on power saving option. By 3pm the battery runs at 85%. is it normal? Or is it because the apps weren’t properly closed causing the battery drain. I felt like the battery runs low faster than my old Samsung Tab 2. Secondly, I tried using mp3 as my ringtone.It is a short mp3 however, there is no playback during incoming calls, so, the incoming calls runs very shortly due to the ringtone. How can I fix this? For battery related issues, you need check the battery usage details in Settings–battery–battery usage. The ringing time actually is controlled by your carrier (and the caller’s carrier), not your phone. Anyway, did you try other ringtones? Will a wireless charger work with a protective case on the phone? Don’t want to buy one if I will have to remove my case each time I want to use it. On a side note I wish the Do Not Disturb feature had an option to turn off the LED as well like it did on my original Mega. Now I have to go in and do it manually every night and remember to turn it back on each morning. Hassle. It depends on the case. Most cases should have no issue with wireless charger. But some very thick ones, or those with special material, may have issues. for the LED, as I know, it is not affected by do not disturb. In some previous Samsung devices, the blocking mode may block the led as well. But the new DND does not. I had a great window (always open) where I could just type in something quickly and it would stay there until I deleted it. I’m not sure if it was S Memo or Note or what it was but I can’t find it anywhere now that I upgraded to the Note 5 from the Galaxy S5. I hope someone knows what I’m talking about although I might not have explained it thoroughly. I have changed my ringtone to custom ringtone by selecting the mp3 in another folder when the pop up came out. Now I can’t go back and see the defaulted ringtones in system folder since it is hidden from the pop up and my files. How do I recover the defaulted ringtones so it will appear again in the pop up without resetting my phone? Clear defaults for the app you used to select mp3 file in settings – applications -default applications. The default ringtones are always there. It’s not listed because you are using different app to select ringtone. After clear defaults for that app, it should ask you to choose app when setting ringtones, choose media storage, then you can see all the pre- installed ringtones. There is no signature for text messages for the messages app in Note 5. Do you really need a signature for a 140-character long sms? Go to the email app and open. Go to ‘more'(top right hand side) and from ‘more’ then select ‘settings’. Hold your finger on your ‘account’ name to open and then edit account details. Halfway down the page is ‘Signature’, tap signature to enter and then edit, and turn off or on. My assistant menu in note 5 keeps on disappearing what should i do? Are you running any task manager apps or battery saving apps or antivirus apps? Hi when opening my first attachment on note 5, it gave me 3 options to open. I quickly pressed write on screen option. How do I change that because it does it by default now? This is a known problem in Galaxy Note 5 (and S6 edge+). The phone does not offer you the option to use the app just once or always. It assumes you will aways use that option. You can go to Settings–Applications — Default applications. Tap clear next to the app is being used. Now, it should ask you to choose one. Next time, it will use this app automatically. you have to clear defaults if you need use different app. Very annoying. Is there any way to use downloaded ringtone from zedge to use as a.contact ringtone. You need find the downloaded music file. Is the easy to use screen mirror function to.samsung tv no longer available in Note5? I can’t find it. For some new Samsung TVs, you can also use quick connect in notification panel. But this works with only a few TV models. In Note 4, it will pop up recomended apps to open a file, videos, music etc, you can select to use a particular app once or always. In Note 5, the function has gone, once an app is selected, it will become the default. If I want to use a different app to open the file, I have to go into Default Application, clear the default before able to use another app. Eg, if I click on a mp3, if I choose google player, it will default to it. If i click on another mp3, I cannot choose another player and it will just open google player. If there a bend around way for this. This is a known issue in Note 5 and s6 edge+. There are no solutions yet. The alarm on Galaxy Note 5 now has less options. You have to try third party alarm apps. Is there any way to assign a ringtone to voicemail notification? It seems to only use the default tone the phone uses for almost every ringer. I need to assign specific ringers to every aspect of communication. of course, you can set different notification tone for vociemail in Settings–Applications–Phone, you can find the Alert sound under voicemail, Set the notification tone for your voicemail there. I just got my note 5 and my voicemail says it is full. I cannot figure out how to get to all those messages and delete them? voicemail is managed by your carrier. All messages are saved on your carrier’s servers. Nothing is saved in the phone. You need check with your phone company on how to manage voicemail. When I set unique contact ringtones in my Samsung Note II or Note 5 the only ringtone I receive is the default ringtone. How do I resolve this? Did you check the settings for that contact? A lot of users forget to apply the settings before navigating away. Note 5 S Note is missing some function from Note 4. Photo note in Note 5 no longer have the function to convert whiteboard image to edit, add frame or changing the effects as in Note 4. Yes, the photo note now does not have many editing features compared to Note 4. It is really disappointing for less-and-less S Note users. The effects are limited to 3: no effects, white background with black& white, or non-white bg. You can still crop, rotate, or add section. That’s is more or less all for photo notes. Please note, photo note is accessed through insert button. If you use camera button in the S Note widget, you can just take a picture with normal photo editing options. i can’t seem to tag puctures in the gallery like before in other Galaxy phones. Can you help me? You cannot manually add tags with the Samsung gallery app in Galaxy note 5. Galaxy Note 5 uses built-in categories. This is strange. Initially I was seeing “fast charging” but recently it is only showing “cable charging” and it is the same charger. Is there something I am missing? What’s the charging time? You may try to insert the USB cable tightly in both ends. Charging time from 15% – 100% initially took me less than 1.5hrs. But now, it takes 4hrs and charging is still ongoing. I tried to re-insert the usb cable, changed to another power socket but it still shows cable charging. Are you using the USB cable you got with your phone? Yes I am. Cable and 3-pin plug that came together inside the box. Not sure. But you can try to reboot the phone. Puzzle has been resolved. Used my Note 4 adapter with my Note 5 cable, now charging is back to “Fast Charging” again. Seems like I have a defective Note 5 adapter. Where is the link to learn about the Camera, specifically, the Video features. I’m mainly trying to figure out what size video to choose to send an MMS, without having to take the video within the messaging app. Thanks! The new message app does not have this feature. How can I lock my screen automatically upon closing the S-View flip cover which would require a finger print or pass code to unlock when I open the cover? I can’t find an option in my settings. The official S view cover has this feature. You need check the the cover to see whether it’s genuine one. The cover is genuine. Is there something I’m over looking? When I go into the lock settings I don’t see an option to lock the screen with the cover, the only option is to lock with the power button. I have a 6 edge with genuine Samsung and have no problems. Did you check settings – accessories? I am not able to attach text message to a picture when I am sending one via text message. I click the paperclip icon and pick the pic I want and then the only option it gives me it to select send. I can not figure out how to attach text to the picture before sending. HELP! Thanks. You type text, attach the picture, then send. If you want to write text on the picture, you can do so in Gallery app. Then attach the modified picture. Send button is on the right side. The left side under the picture is for you to type text. Aftet the picture is selected, it should bring you back to the new messages screen. Are you using the stock Samsung messages app? Yes, I am using the one that came with the phone. I have changed nothing. I have tried and tried and the only way it is possible to attach text to a picture is to forward the pic. It allows me to add text to the pic. I have found no other way. I have had many phones, including Samsungs and they have always allowed text with the picture. A friend has the Note 4 and it lets you attach text to pics. My does not unless I forward a pic. Do you have a Note 5 and you are able to attach text to pics? Of course, we have note 5 and tested it. There are no problems as you mentioned. You can try to compose a new message. Check the left side of the send button, under the picture. did you try Hangouts? You can set Hangouts as default SMS client although it is not a good SMS client. I’m trying to get my Facebook, dropbox & google drove photo albums to show up in my gallery lIke it’s done in the past on my note 3. Any help? How do I access the widgets on the note5? Tap and hold any blank area in home screen. You can them find widgets and tap it to choose choose and place widgets. Anyway to adjust touch sensitivity on Note 5? The setting was removed in new TouchWiz since Galaxy S6. I just got my Note 5 from Verizon 2 days ago. It had a favorites contact widget on it but somehow it is gone today. I can’t find it in my available widgets to use. I have had problems receiving text messages and have had to change some settings on my phone through tech support. I’m not sure if something we did removed it. Any suggestions???? Not sure. What does the widget do? Any idea how I can lock my S Note memo without having to move it to Private instead? Had this feature on previous Notes but not this time round. Please help. Thank you in advanced. You need download the extension pack to get this feature. Open S Note app, tap MORE–More features–extension pack. Dose the Samsung note 5 let you select pictures and create a video like Note 4? I’m not seeing that option. In which app on Note 4? If you are using Samsung video editor on note 4, you can still install it on note 5. How to set ringtones for each contact on Note 5? Those are the instructions for the S6, not the Note 5. There isn’t the option to add another field on the Note 5. Add another field is surely available in Note 5’s contacts app. You need make sure the contact is NOT on SIM card. You can create a new contact on the phone and then test. I just bought the note 5 and cannot figure out how to turn the screen mirroring on. There isn’t a button anywherr! Help! Swipe down from the status bar (top of the screen), tap edit. You can then find the screen mirroring icon. If you use it often, you can tap and hold the icon to move it to one of the top 10 positions (or top 5). I just reset my Note 5 to factory default. Now I don’t have an icon for screen mirroring. It was there before the reset, but not now. Instead of “Screen Mirroring” I have something called “Smart View” but it doesn’t pick up my Chromecast like Screen Mirroring did. My TV is a Samsung, but not a smart TV. And I use Chromecast to watch Netflix, but I also was able to screen mirror from my phone to TV using the Chromecast and screen mirroring. Is there anyway to get the “Screen Mirroring” option back? For Chromecast, you should use Chromecast app, and then select screen cast for screen mirroring.